Files get deleted that are needed. A real-world tech issue solved by real-time data protection. Ultimate Recycle Bin – AKA, “The Recycle Bin for the Network”. Protecting shared files on file servers, as well as local files on workstations. 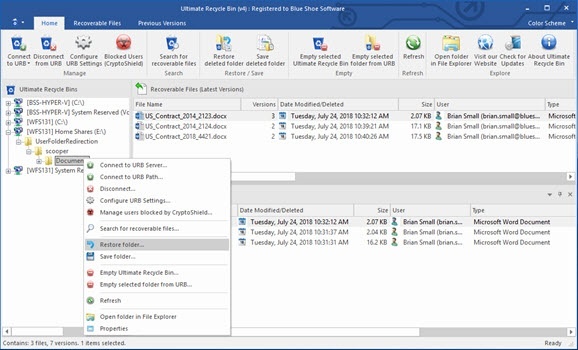 Utilizing Honeypot Files and File Screening (we have over 1000 known ransomware file extensions and drop file names), URB can detect when a user is attempting to encrypt files on your file server. Once detected, this user (and only this user) is blocked from modifying files on the file server until unblocked by an administrator. The price tag of data loss, re-writing documents from scratch, and the valued time spent searching for accidentally deleted or overwritten data through insufficient backup tapes or snapshots is expensive. Ultimate Recycle Bin pays for itself time and time again. Take a selfie, not snapshots! For true continuous data protection – Windows shadow copies and tape backups alone are not the best solution, they don't tell you who deleted the file, and don’t capture all deleted files. Guys, the keyword here is continuous. Since backups don’t include all the file changes/deletions in between backups, there is no guarantee that the file needed will be found. Ditto for the snapshots and with the extra space requirements needed, clearly there has to be a better solution. You are an IT professional. You have plenty to do. Your job is demanding and you don’t need to spend valuable time finding deleted files. Allow Ultimate Recycle Bin to do this for you, making your days (and sometimes evenings) more productive. Stop users from asking “Oops! I accidently deleted a file from the shared network drive, can you find it?” Allow users to find and restore accidental deleted and/or overwritten files, without troubling the IT department. Free the IT!! Eliminate pleas of help for restoring deleted files. Enable self-service recovery. Find “file saves" from products such as Microsoft Office (Word, PowerPoint, Excel, etc), Adobe Photoshop, AutoCAD, muliple text editors on servers and/or workstations. This capability allows users to go back to previous versions of their working documents, right from their desktop. Protect every volume on the file server, or just one specific folder on one volume (the D:\SharedData) folder, for example. Filtering options are endless. 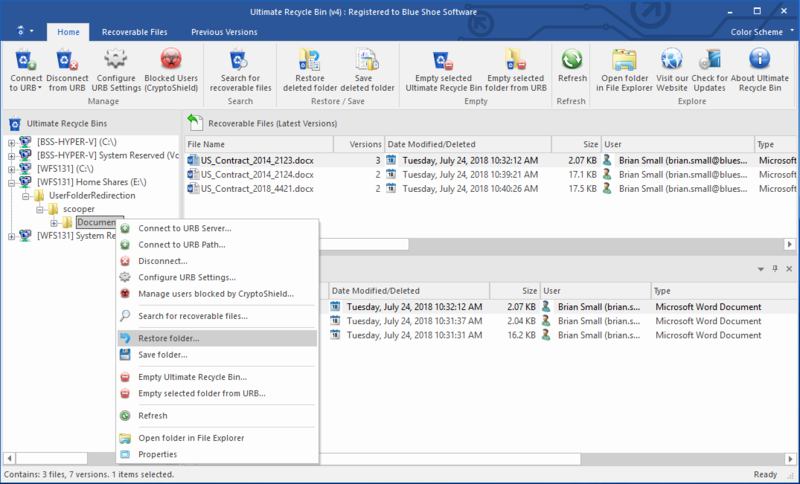 Install Ultimate Recycle Bin on your Windows file server, and capture files deleted from clients - without having to install any client software. 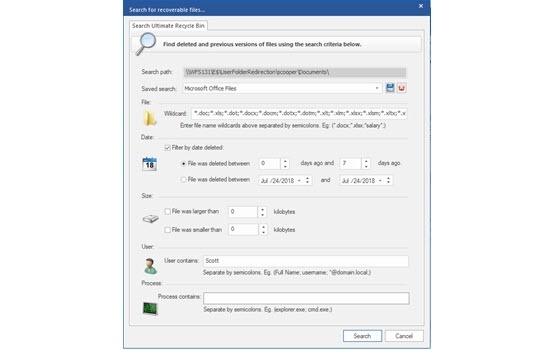 Easy to use interface also allows for tremendous search capabilities - search by date deleted, file name (with wildcards), user who deleted the file, size, and more. Quickly browse through deleted files in the same folder structure of your live files. It's never been easier to find deleted files. Supports both physical and virtual servers using VMware, and Microsoft Hyper-V environments. Server license comes with unlimited client licenses. Explorer Shell integration - allows end users to easily restore their own files, without contacting the help desk. Just right click on a folder and choose properties, the Ultimate Recycle Bin tab will appear with any previously deleted or overwritten files. Configure Ultimate Recycle Bin to never take over x% of free space or x% of total space. Ensures Continuous Data Protection (CDP), also known as continuous backup, for your protection. Accidentally deleted or overwritten Microsoft Office files? Content takes time to create. Do it once, not twice. Find deleted and overwritten files efficiently with Ultimate Recycle Bin and restore back to previous file versions easily. No longer does IT personnel need to waste time insufficiently digging through backup tapes, NAS (network attached storage), the cloud, or snapshots to find deleted files. These methods do not capture every version of a file, including the file you may need! Ultimate Recycle Bin retains all file changes, unlike backup tapes, which only capture the last file change before the backup is completed. Snapshots could be used, but with space issues, extra work for the system administrators, and time lapses between file changes and snapshots - that's not the best solution either. 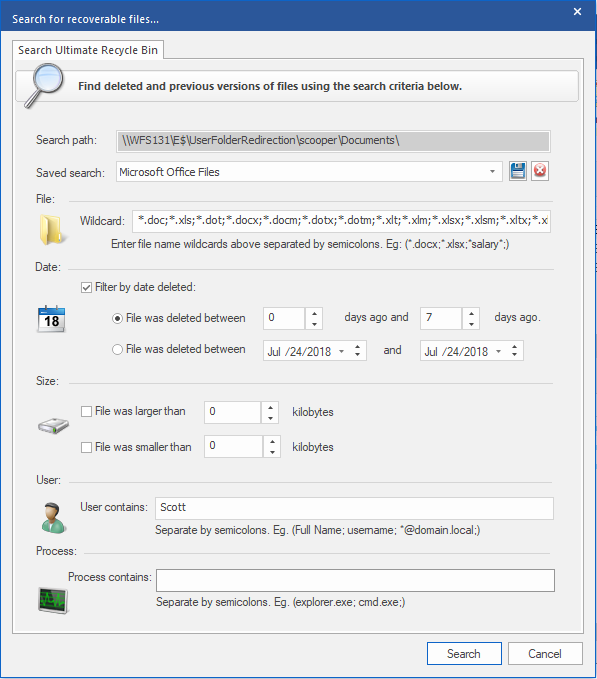 Ultimate Recycle Bin solves this problem and makes it easy for both IT and end users to help themselves to find wanted files that have gone missing. Instant recovery of changes to Microsoft Office and other selected file types between backups and snapshots. From the server to the desktop, capture and restore deleted files with extremely low overhead. Works in the background seamlessly. Eliminate frustrating help desk calls regarding lost files. Save IT personnel time and make it easy to find deleted files for IT and/or the end user. Helpful during migration time to ensure data protection. After installation is complete, Ultimate Recycle Bin takes up about 20MB of drive space. "We used to go through our backup tapes to recover files that users have deleted, but restoring files from the backup tapes was a lot of work and not working for us. 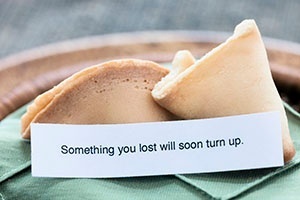 Unfortunately, our company lost files that were needed, because the files were sometimes not backed up before users realized that their data was gone. Ultimate Recycle Bin stopped this from happening and ever since we installed Ultimate Recycle Bin we no longer have any issue with regards to missing deleted files." "Ultimate Recycle Bin has saved us time and money. Neither I nor my IT department coworkers have the issue of restoring deleted files, which is a real time saver. We used it on both physical and virtual servers and the clients that accompany the server edition. Plus, we are planning on a migration in the next few months. Trusting Ultimate Recycle Bin to capture accidentally deleted files puts me at ease." "I can’t tell you how many times a user has asked me to find his file that he “saved over” or “overwritten” in a Word or PowerPoint doc. Some things never change. Ultimate Recycle Bin has saved us the hassle, time, and money involved in re-creating files from scratch."